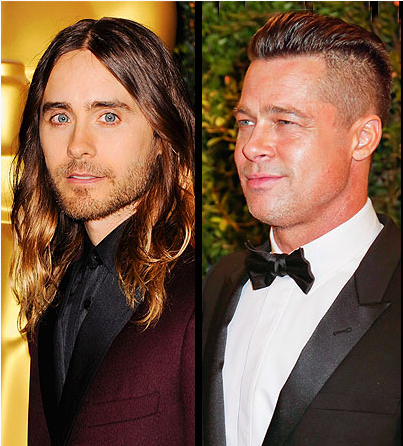 Brad Pitt jealous over Angelina Jolie's crush on Oscar winner Jared Leto. Take heart, gentlemen — even Brad Pitt gets jealous sometimes! A source says Angelina Jolie has been gushing over Jared Leto ever since his Oscar win for best supporting actor, and it’s grating on her partner of nine years. “She can’t stop saying how good he looked and what a great actor he is,” the source says of Angie, 38, who is rumored to have had a fling with the Dallas Buyers Club actor, 42, when they worked together onAlexander in 2003. And while Brad, 50, is “trying to keep his cool,” it’s tough. @4:09 You know this how? Because they're not ratchet and in front of ever papparazzi camera. Their personal life is not for our entertainment. While you're judging their lifestyle, they're out trying to save the world. Yeah humanitarianism real boring. Don't you mean Angie, 42 and Jared 38?